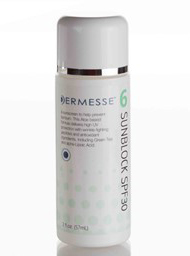 DERMESSE SUNSCREEN SPF 30 – This special sunscreen formula is designed to help prevent sunburn and minimize premature aging due to sun exposure. The Aloe-based formula delivers high UV protection with wrinkle fighting peptides and antioxidant factors including Green Tea and Lipoic Acid, vitamin A and vitamin E. Ideal for use on the face and neck. DERMESSE BROAD SPECTRUM SUNSCREEN SPF 50+ – This silicone based product is rich in Aloe, contains no irritants and is safe and effective for all skin types. It is 80 minutes water-resistant, the highest rating allowed by the FDA. Fragrance free, cruelty free and paraben free. Ideal for the face and body.